Donovan Jamal McNabb was born on 25 November 1976, in Chicago, Illinois,USA, and is a sports analyst and former professional football player who’s best known for playing as a quarterback for the National Football League’s (NFL) Philadelphia Eagles. His success throughout his football career has put his net worth to where it is today. How rich is Donovan McNabb? Sources indicate that his net worth is estimated at over $35 million, mostly acquired through a highly successful football career. Even after football, he reportedly earns $14 million a year broadcasting for Fox and the NFL Network. He’s also done received endorsements which have helped raise his wealth. Donovan started his football career when he attended Mount Carmel High School. During his sophomore year, he helped lead the school to a 1991 State Championship and then in his senior year, the Chicago Prep Championship. Around this time, he was also a part of the school’s track and field team as well as the basketball team. From his success at high school, many college recruiters sought him out. Despite numerous invitations, only two schools offered him an athletic scholarship, Syracuse University and University of Nebraska. While Donovan was inclined to go to Nebraska , he eventually decided to play at Syracuse University – a good broadcast journalism program at Syracuse helped him make his decision. At Syracuse, McNabb became a starter for every football game, and was named the Big East Conference’s Rookie of the Year, completing the longest touchdown pass in Syracuse history. He was also named Big East Offensive Player of the Year three times, earning first-team all-conference votes each college season. He became a finalist for the 1998 Heisman trophy and was later named to the Syracuse All-Century Football team. In the 1999 NFL Draft, Donovan was chosen as the second overall pick by the Philadelphia Eagles. The drafts were considered very rich in quarterback prospects, but only McNabb and Daunte Culpepper went on to make significant progress in their careers. Donovan would go on and win his first rookie quarterback appearance, a feat that hadn’t been done since 1974. In the 2000-2003 seasons, Donovan would continue to make solid performances to lead the Eagles to the NFC East Championship each year, only to falter at the championship match. He became part of the Pro Bowl twice during these seasons, and 2003 became a very slow season for him statistically, earning some criticisms on how he could not perform in the big games. 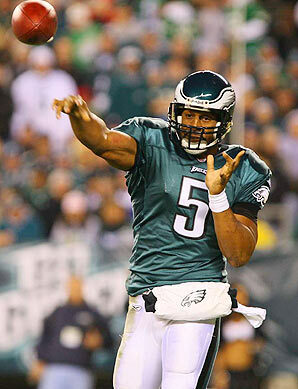 In 2004, McNabb recorded one of his biggest performances, solidifying him as one of the best quarterbacks in the league. He led the Eagles to their second Super Bowl appearance, where Donovan became the third African-American quarterback to start in a Super Bowl. They faced the New England Patriots but lost to them by a close 24-21 margin. The years 2005 to 2007 became troubling for Donovan as he battled with injuries which became a detriment to his play. He suffered from a sports hernia and a sports thumb, and in 2006 he suffered a torn anterior cruciate ligament (ACL) which side-lined him for eight to twelve months. He returned earlier than expected in the 2007 season to play a few games. He was reinvigorated in 2008, and started to play well again, leading the Eagles to yet another playoffs appearance. He repeated this in 2009, but struggled in the first-round of the playoffs against the Dallas Cowboys. Despite this, he was still given Pro Bowl honors. In 2010, Donovan was traded to the Washington Redskins, and completed one of his lowest statistics since 1999, so the following year he went to the Vikings but was later on denied a starting position. He requested release from the Vikings, and in 2013 retired as a member of the Eagles. Aside from a very detailed sports career, not much is known about McNabb’s personal life. He has been married to Raquel Nurse since 2003 and and they have four children. He’s also been given jail sentence due to driving under the influence a couple of times. 1 The Philadelphia Eagles retired his uniform number (5) during halftime of their game against the Kansas City Chiefs on 19 September 2013. 2 Philadelphia Eagles all-time leader in passes completed (2,801), passes attempted (4,746), passing yards (32,873), passing touchdowns (216), and passing yards per game (222.1). 3 Was a reserve point guard for Syracuse's 1996 national runner-up men's basketball team. 4 Second overall pick in the 1999 NFL Draft out of Syracuse University. Was named the Big East Conference's Player of the Decade for the 1990's. 5 Second of five quarterbacks selected in the first round of the 1999 NFL draft, after Tim Couch (Cleveland) and ahead of Akili Smith (Cincinnati), Daunte Culpepper (Minnesota), and Cade McNown (Chicago) By the start of the 2004 season, McNabb and Culpepper were the only two still in the NFL. 6 Along with his mother, Wilma, stars in commercials for Campbell's Chunky Soup. She suggested that players' real-life mothers be used in the ads. Prior to the 2002 season, actresses played the roles. 7 First child, a daughter named Alexis, was born on September 23, 2004. 8 Quarterback with the Philadelphia Eagles (1999-2009), Washington Redskins (2010), and Minnesota Vikings (2011).